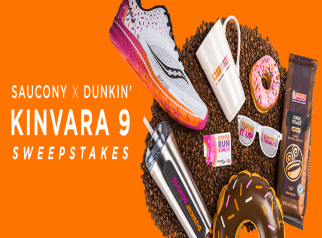 Saucony x Dunkin’ Kinvara 9 Sweepstakes – Win a Dunkin’ gift card & Saucony shoe! Win a $26.20 Dunkin’ gift card and a Saucony X Duncin’ Kinvera shoe (16 winners)! ENTER SWEEPSTAKES HERE – Saucony Sweepstakes page. ENTRY LIMIT – Limit: Each entrant may enter one (1) time per day to receive up to a total of five (5) entries during the Promotion Period. ELIGIBILITY – Saucony x Dunkin’ Sweeps (the “Sweepstakes”) is open only to legal residents of the fifty (50) United States and the District of Columbia who are at least eighteen (18) years old at the time of entry. SWEEPSTAKES ENTRY PERIOD – The Sweepstakes begins on April 6th 2018 at 12:00 a.m. Eastern Time (“ET”) and ends on April 30th 2018 at 11:59 p.m. ET. PRIZES – SIXTEEN (16) GRAND PRIZE(S): A $26.20 Dunkin’ gift card (terms and conditions of gift cards apply), one (1) Saucony X Dunkin’ Kinvara Shoe Approximate Retail Value (“ARV”): $110.00.